Comics In 5 Panels: W2 and Eyz talk "Steven Universe." It wouldn't be a proper Cartoon-Month before I've giving my thoughts of what has quickly become one of my favorite animated TV-shows of all time; "Steven Universe". And I even have with me today the guy who got me hooked on it to begin with. Thanks for having me back here again! So, Steven Universe! Such a great show, right? "Steven Universe" follows the adventures of the boy Steven. He lives with his dead mother's three friends; Garnet, Amethyst and Pearl, who are a team of magical alien ladies who calls themselves The Crystal Gems, protectors of the planet from supernatural threats. So besides raising him, they also train Steven to become one of them, just like his mother. 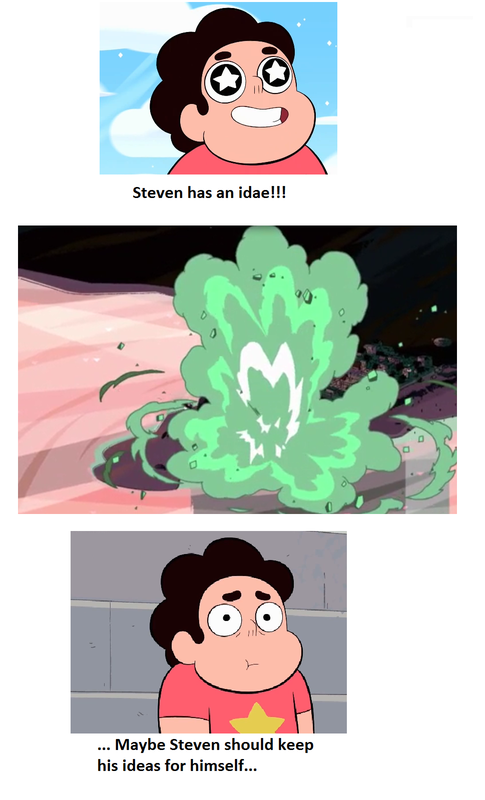 But Steven doesn't have much control over his powers. Not that it stops him from tagging along on the girls' adventures. I believe "magical alien ladies" already sums up the entire concept of the show! It's already one of the more prominent new shows of this sort of "revival", this second Golden Age's Cartoon Network's being going through lately since the launch of Adventure Time. Putting (indie) artists in charge of new series and letting them have entire creative freedom about whatever genres or themes they want to explore. In fact Steven Universe was created by animator/storyboard artist and compose Rebecca Sugar, who previously worked on Adventure Time. (It's kinda sad to say) she is the first woman to create a show for the network. She used to do such a great work with stories and song on Adventure Time, I'm glad to see someone like her at the head of an entire cartoon! I couldn't agree more. "Adventure Time" wouldn't have been the same if it wasn't for Sugar. "I Remember You" made me sad for weeks(and yes, I'm easy to tears, DON'T JUDGE ME). And even though I'm glad that she created "Steven Universe," it made me sad that she left AT. But enough about Sugar being awesome. Let's talk about her awesome show. Eyz, what is it you like about the series? Steven Universe is such a great show! It's not just a fun "all-age" cartoon, both kids and adults can enjoy it! Characters aren't stereotypical in either design or personalities. Things are nuanced. One episode can be a silly standalone goofy story and then be followed by some pretty impressive world-building on-going threads. Steven himself is without a doubt the heart of the show. He might start a bit "stupid" (for a lack of a better world), but his enthusiasm carries the entire series. Yes, the best way to describe him is as sweet, creative, considerate and only occasionally annoying. And since child characters in cartoons has a tendency of being... well, stupid, it says a lot about the shows quality. So far, the shows universe(no pun intended) is a bit small and compact, but it has a nice combination of the magical alien girl adventures as well as the events in Beach City, one of those tiny towns that only exist because of, well, the beach. And the towns function in the show is not just filler until we get some magic weirdness, we actually care about the people who live there. We care about the mayor who at first seems like a cheap gimmick politician, but actually means well. We care about Sadie and Lars who works at the donut shop. We care about Ronaldo who tries to make his life meaningful by writing a blog about the weird stuff that's going on in Beach City. The characters get surprisingly well fleshed out. A lot of episodes are based or revolve around the inhabitants, keeping most of the cosmic-scale epic in the background. What I really like is how it's basically a "magical girl anime" disguised as a fairly typical Cartoon Network comedy show. Taking the best of both worlds for much wider audience than you'd expect.Really, this show manages to do a lot of good and can get surprising deep sometimes. Not to mention the whole family element. This IS a very strange family Steven has. 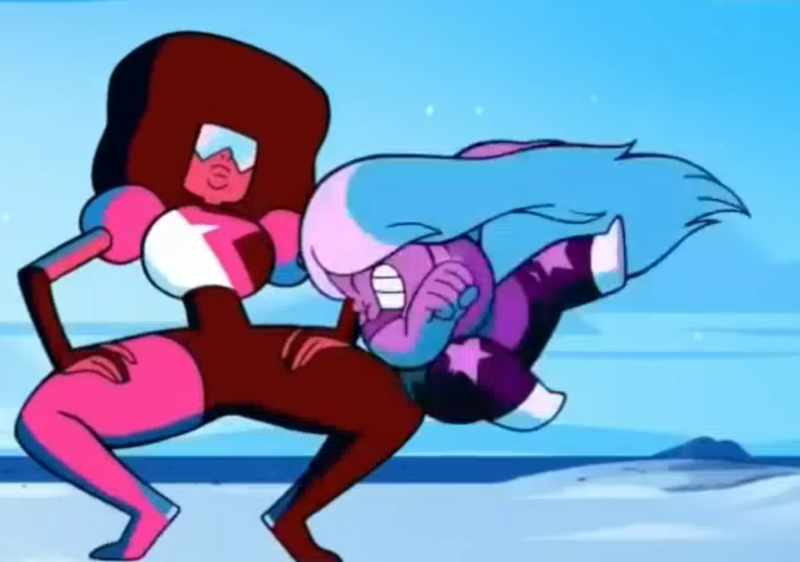 But before we dig into that, maybe we should talk a little about Steven's three moms/big sisters/aunts? She certainly starts the more enigmatic of the three. She rarely talks at first. She seems the calmer of the three. But we later find out she's actually full of emotion(s) (literally). The strongest of the team. She serves as a great mother figure to Steven, someone to look for. Anything you want to add? What's your take on Garnet? because me and Garnet once danced together? I'm not going to lie here; for a long time, Garnet used to be my least favorite character in the show. Not that I didn't like her, I just didn't like her as much as the others. It had something to do with her seeming uninteresting at first. But as I watched the show, she started to grow on me. One of greatest traits is that she is the one of Steven's three "moms" who takes Steven more seriously, and always value his point of view as well as suggestions to how a situation can be solved. And she is a rock to the other gems as well. She is the unofficial leader due to her level head, as well as the fact that she is the one with most raw strength. And because she is so cool-headed , it makes it that more powerful when she panics or gets frustrated and don't know what to do(Like in "So Many Birthdays"). It's very rare that she makes a bad decision(like she did in "Coach Steven" or "Future Vision"). But not in a way that would be out of character, which is more impressive than it sounds. But my favorite character is Pearl. This one I liked from the start. She's the one to actively take the motherly role pretty seriously with Steven. Even if she doesn't seem to understand humans much at first.And also an excellent fighter with a sword! With her apparent detachment from mankind at first yet being overly protective with Steven, a lot of humor seems to come from interactions with the others at first. Even if she tries to be the calm, quiet and wise one of the three. Pearl is in theory the most calm and mature of the three gems. As well as the most intelligent one. I remember once wondering why SHE wasn't the one in charge, especially after learning that she used to be Rose's second in command. And she does take her role as a parent very serious( if anything a bit overprotective, such as watching Steven as he sleep). But unfortunately, she is a bit... emotional unstable. Back when Steven's mother, Rose Quartz, was still around, she was the leader of the Crystal Gems, and she loved and cared for Garnet, Amethyst and Pearl. But I think it's safe to say that Pearl had hoped for... a different kind of love. So it must be difficult to watch Steven grow up and see him become more and more like his mother. I'm not implying anything unhealthy, I'm just saying that it reopens some old wounds(as seen in "Sworn To The Sword"). And when she does something risky and impulsive, she does it big time(like in "Space Race" where she builds a spaceship). Recently, she has been described as "a lost and defective Pearl," so I believe that we will eventually be told the story about her possibly sad past. Speaking of witch, let's talk about Amethyst. My final "favorite"! Like I said, it's difficult to pick a favorite! Perhaps the only one I wouldn't call a mother figure to Steven, but Steven does appear to consider her one of his moms. Maybe she'd be closer to a big sister-type. Amethyst's the fun one. The one that quickly grew up attached to more human-ly things (like bad TV shows and eating food). And for a good reason since she was basically "born" on Earth ('trying to stay vague and avoid spoilers here!). She gets the best jokes and started as the more comical figure of the group but once they start hinting and exploring her past, she because just as deep as the rest. I actually never thought about Amethyst's liking of human stuff like that. Kudos to you, sir! And I agree on Amethyst being more of a big sister than anything else. And that is a good thing. We can all sometimes be in need of one of those. Someone older and more mature than you, but not THAT mature. The only problem can be that you follow her and listen to her when you shouldn't, forgetting that even though she is older than you, she is not an adult. I don't have a biological big sister, nor a stepsister, but I know a woman who has that kind of role for me. Amethyst's past is the first element that made the series darker(It's actually the past who has her more than she has it). But still in a way that allowed the show to keep it's Steven-perspective, through a child's eyes. We see it in a way so that the adults has a pretty good idea what happened, and the kids gets that it was something bad without fully understanding it. We have talked a lot about the characters. Maybe we should talk about the episodes? Eyz, do you have a favorite/least favorite? Ladies and gentlemen, I give you the most competent man in Beach City. ... I'm not even kidding! Let's keep it around season one, shall we? I think the first half of the show's debut season started pretty simple. A lot of emphasis on comedy, with world-building only kept in the far background. Like your typical Cartoon Network shows (in a good way). But once past the mid-point the show really picks up and starts getting a lot more deep. More focuses. And the last few episodes of the show's first seasons are some of my favorite cartoon episodes in ages. I think of it as that we see the world through Steven's eyes. At episode one, his world IS pretty simple, like it is for any ten year old kid(with the exception that his family is magic alien ladies). But it's also at that age that you REALLY start to notice the world around you, both it's wonders and flaws. It's the part of his life where he is losing a bit of his innocence. But it's also about child raising. As we have pointed out, family plays a big ole in the series. The Gems are starting to take Steven with them on their adventures, struggling with preparing him for his future as the planet's protector. But sometimes, more often than one would think, it's actually Steven that teach them something. And there are surprisingly many episodes that centers around Steven and the girls just staying at home, and do something like making breakfast, celebrating birthdays or something normal like that. It may not sound that important or exiting compared to fighting a giant worm or flying eyeballs, but it's just so great seeing them interact with each other. Yeah, like we said before the interaction is great on the show! Some episode simply just rely on the characters and no overall big arching plot. The rest of the inhabitants of Beach City are just as interesting. A particularly good early episode revolves around Steven forming a friendship with this kid Peedee who already has to work at his dad's place. 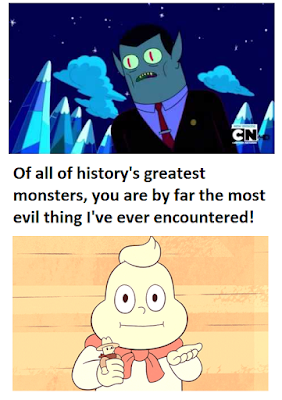 While Steven tries to stay overly positive and always enthusiastic, through Peedee we get an entirely different view on life ("I don’t see anyone smiling. You pick up a job to buy a house or raise kids or to...impress your Dad. You work away your life and what does it get you? You get cash, cash that can’t buy back, what the job takes", a great quote by the by). Which makes me think this half-human half-gem that is Steven is perhaps the combined best of both worlds, but that also means Steven doesn't know the flaws of both species at the beginning of the show. And his discovery of what it means to be both is the journey of the show. It's such a great show. It is funny, it's deep, it's creative and colorful, has plenty of wonderful music and most important of all; it's cute without being cloying. And I can only remember ONE episode that I didn't like(Secret Team) and it wasn't really bad, just... meh. It's a wonderful show than anyone can enjoy It explores a lot unique themes. A lot of life drama, despitie the overall comedy nature of the show at first. It's a great exploration of relationships, childhood adventure and what life revolves around. All this through a pretty innovative and provocative take on "Magical Girl" animes. Yet, perfectly in line with the great new shows Cartoon Network's been producing these last few years. All in all, I can't recommend it enough! And that's all we can tell you without spoiling too much of the plot. Thanks again, Eyz, a pleasure as always.